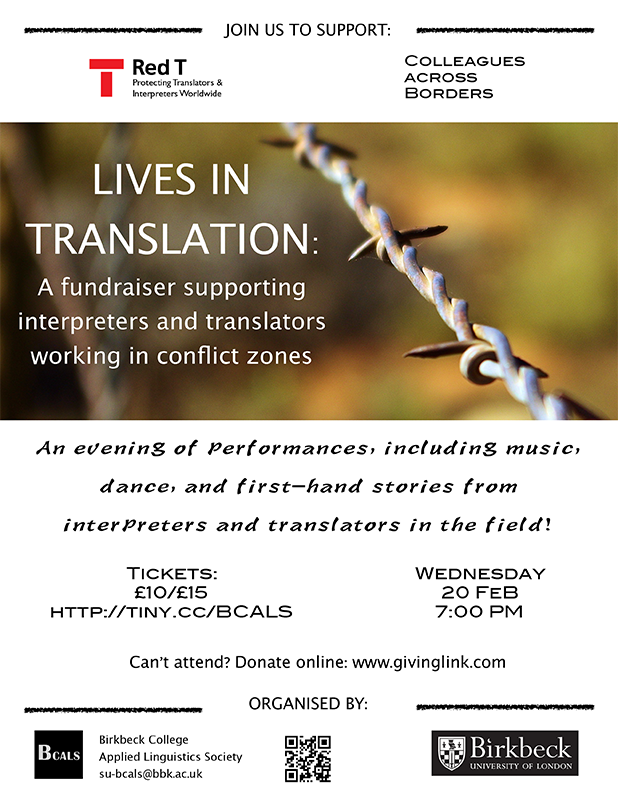 The Birkbeck College Applied Linguistics Society (BCALS), together with the Department of Applied Linguistics and Communication (ALC), is hosting a fundraiser for Red T and the British charity Colleagues Across Borders. The latter offers pro bono support to interpreters and psychosocial workers who assist traumatized refugees and asylum seekers. If you are in the London area, join us to learn about Red T’s advocacy directly from our founder. And then stay for music and dance performances celebrating multilingualism and multiculturalism. Details in the flyer below. We are very grateful to Dr. Lisa McEntee-Atalianis and her students for all their hard work in organizing this event.